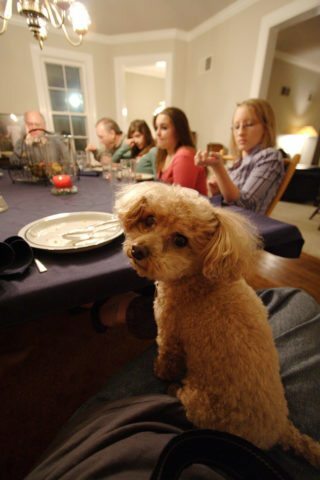 We all look forward to spending Thanksgiving dinner with our families — which often includes our dogs. After all, they are part of the family, and they love to be the center of attention. Dogs also like being handed treats by family members and guests. However, this can be dangerous — even fatal — to your dog. Can dogs eat turkey? Yes. But there’s a limit. Can Dogs Eat Turkey Meat? Yes, you can give your dog some turkey meat and even a little gravy. However, when placing the meat in your dog’s bowl, be sure to remove all pieces of bone — because dogs and turkey bones aren’t a good combination. Just like chicken bones, turkey bones splinter and can cause blockage or perforation of the intestine. For example, use caution when feeding your dog turkey skin. It’s great for a dog treat — but too much can cause a case of canine pancreatitis (inflammation of the pancreas). Canine pancreatitis causes severe diarrhea and vomiting — which can then lead to dehydration. Other symptoms include: stomach pain, refusal to eat, crying or whimpering, weakness, and irritability. Never leave turkey (or other food) on the table or counter where your dog can get it while everyone is enjoying the holiday festivities. If your dog has a dog run, kennel, or crate, your best bet is to keep him safely inside it until all of the food has been put away and the scraps and bones disposed of. Other Thanksgiving dangers for dogs include turkey pop-ups, string, skewers, cellophane wrap, tin foil and plastic bags. The best way I’ve found to dispose of these things is in metal coffee cans with a tight-fitting lid. As a reminder, dogs and alcohol don’t mix either. 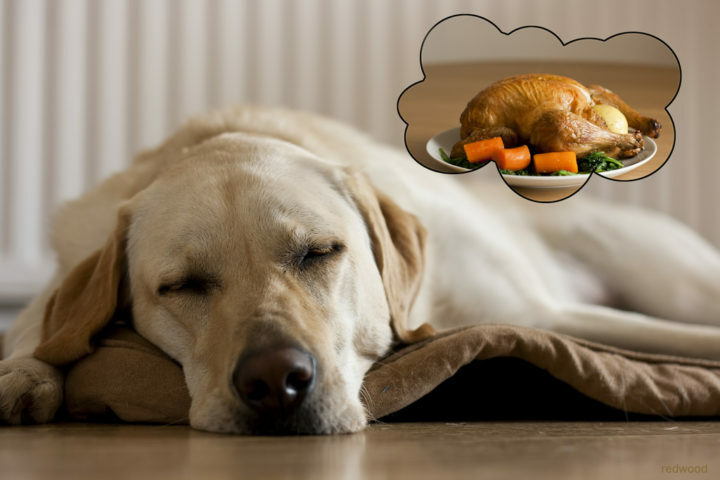 If your dog eats a lot of turkey (or other foods dangerous to dogs), it can take up to a week before symptoms are evident. 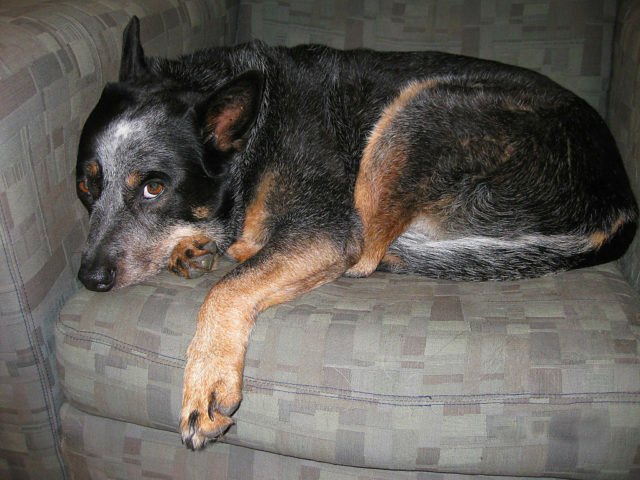 Canine bloat can be fatal if not treated immediately. Bloat is caused by excess fluid and/or gas in the intestines and stomach — which can cause the stomach to dilate and rotate. Rotation of your dog’s stomach is known as gastric dilation or torsion. This is common in larger dogs that have a deep chest. It is a life-threatening condition. Here’s how to tell if your dog is at risk for bloat. 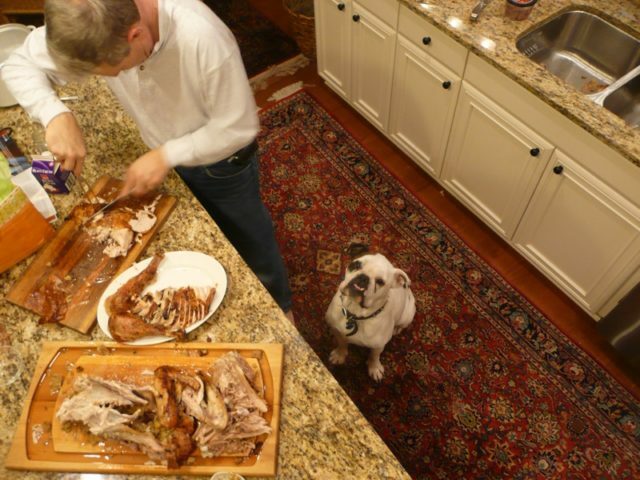 So, can dogs eat turkey? YES! But if you think someone gave your dog too much turkey or table food, contact your vet. The same is true if your dog got into the trash and ate something he shouldn’t have. Since most vet offices are closed on weekends and holidays (including Thanksgiving), you should have an emergency vet contact number on hand. Most likely, this will be the Pet Emergency Center closest to your home. 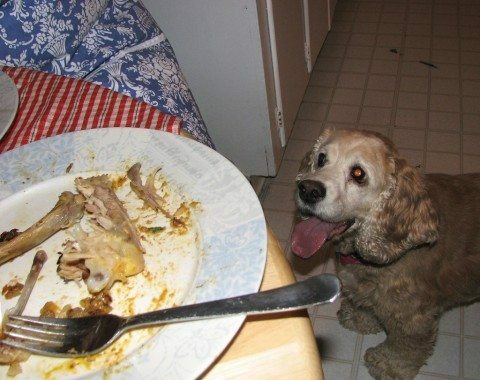 TIP: Be sure to caution your Thanksgiving guests about giving turkey and other table food to your dog. Insist that there be no sharing… and stick to your guns! It’s up to you to keep your dog safe this Thanksgiving. 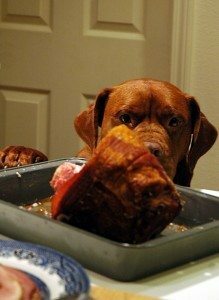 Instead of giving table scraps for a dog Thanksgiving dinner, make some Thanksgiving dog treats as a way to include your dog in the family meal. 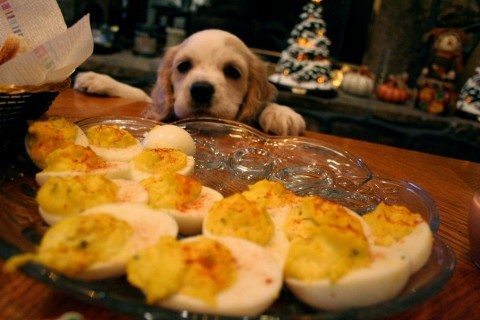 Here are my favorite Thanksgiving recipes for dogs.